Evaporated Milk or Golden Syrup? In our minds, an “American Breakfast” meant pancakes. On these special weekends, mom would whip out her trusty bright yellow box with the cobalt blue letters making up the word ‘Bisquick‘ written across the top. Yes, ‘Bisquick’ was our connection to pancakes and for much of my youth, that is how I thought these flat round breakfast cakes were made. A few cupfuls of the magic powder, eggs and milk and voila… pancakes! In Mark Bittman’s book, “How to Cook Everything,” he writes “Americans must have been sadly alienated from the kitchen for pancake mixes to have gained a foothold in the market, for these are ridiculously easy to make.” It seems my mother was not the only one relying on these ready-made pancakes to go. Don’t get me wrong, I have nothing against the pre-packaged stuff, but once I started cooking for myself, I also thought they were”ridiculously easy to make.” I will admit that when I first lived away from home and when a craving for pancakes hit, I wasn’t sure what to do. I hadn’t thought of packing boxes of ‘Bisquick’ in my shipment and I also couldn’t find them in the supermarkets of Milano, Italy. Luckily, as a going away present, I had received a fine cookbook and thanks to Mark Bittman, I no longer had to rely on the boxed stuff. Instead, I learned different ways to create quick, simple and delicious pancakes from scratch. When I was a child, I knew for sure that there was something drastically peculiar about the way we ate our pancakes at home. Mom did not serve this breakfast treat in the “American way.” The image we upheld came from a few visits to McDonalds. 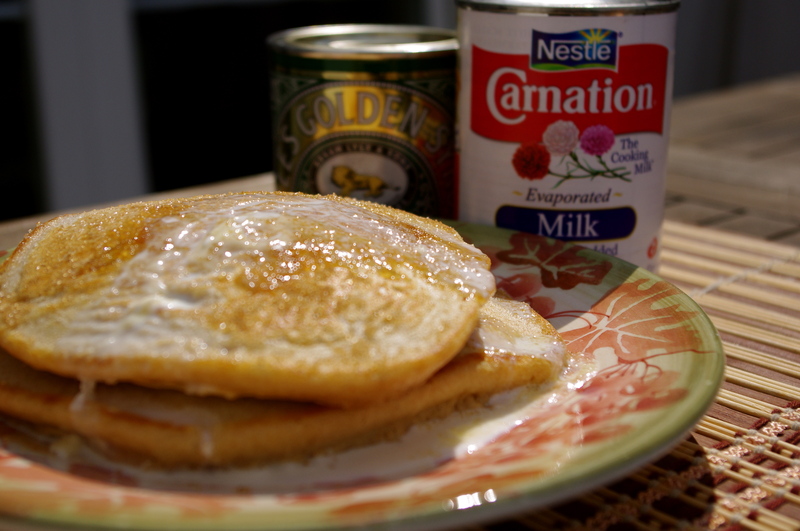 Three golden hotcakes patted with butter, lying flat across a white styrofoam platter with a small plastic container of golden syrup on the side. No…we were slightly different. Our breakfast table supplied butter, but there was also a bowl of sugar and a pierced can of evaporated milk sitting ready to top the pancakes with. Yep, that was how we ate them. Hot off the griddle, my mom would stack a few of those light brown circular steaming cakes to our plates. We would quickly grab our silver knives to spread the butter and let it evenly melt around. Then with a teaspoon, we sprinkled the white sugar crystals in liberal amounts, poured the evaporated milk over the pancake and let it to soak up the mixture. Moist and sweet, this was how we feasted on pancakes. Eventually, our increased exposure to American commercials and New York diners led to our requests to also have syrup at the table. Aunt Jemima’s Golden Syrup, however, was unable to ever conquer the reign between Carnation’s Evaporated Milk and Sugar alliance. Mark Bittman’s pancake recipe was my introduction to cooking pancakes from scratch and since then I have explored many new ways to make them. Lately, the one I enjoy most is a very healthy version from “The New Laurel’s Kitchen.” However, I don’t follow it to the exact measure and therefore, I think my adaptation has lost some of its nutritious value. The book calls for whole wheat flour and oat bran. I use a cup of white and a cup of whole wheat. The cookbook also suggests a recipe that substitutes milk for buttermilk. I discovered that by using this thick, sour and creamy liquid, it produced a fluffy texture and I have never gone back to using the plain ol’ stuff. When the pancakes are ready to eat and it comes time to add the toppings, I travel back to my roots. I gladly dive into the sugar bowl, reach for that can of evaporated milk and drown my pancakes. Old habits are hard to let go. In another bowl, beat the two eggs and then stir in the buttermilk. Add the liquid mixture and oil to the dry mixture. Add a dab of butter or oil. Pour half a cupful or less of the batter into the pan. Watch for bubbles. When you see them, flip pancake over. Add the toppings of your choice!